Located between Montmartre and the Drouot Antiques District, the Best Western Premier Opera Faubourg offers an offbeat mix of contemporary British design and vintage '60s and '70s style. This unique design vision is reflected in the decor of the 103 rooms, including six suites. Amenities include free Wi-Fi, iHome docking stations and flat-screen TVs. Room service, luggage service and an e-concierge are also available. 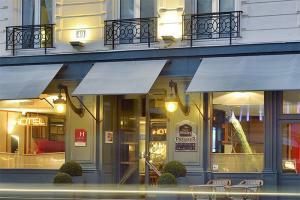 The hotel's proximity to Montmartre, train stations and metro lines make this the perfect choice for leisure travelers. 16 miles from the Charles de Gaulle Airport. In the 9th arrondissement, close to train stations, metro lines and Montmartre.